American Steel Span has moved the structural strength of steel to the exterior of our prefab steel buildings, providing a super-durable, cost and labor saving alternative to more common construction techniques. Prefab metal buildings from American Steel Span consist of corrugated arches that provide strength and durability that virtually withstands the harshest weather conditions that Mother Nature can provide. The last nine inches of each panel are flat so that it fits tight to the next panel when bolted together providing a tight seal on each prefabricated metal building. In the erection of a prefabricated steel building, this can equate from a 30 to 40% time savings and no caulking is required. With two rows of bolts the overlap has a strength equivalent to 0.030 over 0.030 in an American Steel Span prefabricated steel building. The crimps in the panels of American Steel Span prefab steel buildings are smaller in depth than that of the competition and closer together. This increases the strength of the panels as much as 25% and alleviates buckling problems. The roof/sidewall systems of our prefab steel buildings are made of AZ55 Galvalume® and contain 55% aluminum, 43.5% zinc and 1.5% silicone with a direct warranty from the steel mill. Studies show that the panel life is 40-plus years. The colored roof/sidewall panels and the colored endwalls of an American Steel Span prefabricated steel building carry a 30-year warranty against chipping, blistering, cracking and peeling. 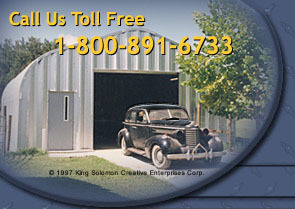 Prefab steel buildings are an excellent alternative to conventional construction.